The first thing is to understand what the Shingo approach is and why it might be useful. We have found that this helps create that lightbulb moment for people who feel their improvement programme has failed to sustain or plateaued or just that ‘there is something missing’. After gaining a basic understanding, the next step is to dig deeper, find out more and see how the approach really works. We have found that this helps create the knowledge of ‘how does this all fit together’, what does a Shingo winner look and feel like and ‘what am I missing’. Once you have developed a good knowledge about Shingo it is then useful to see how far your organisation is along a Shingo journey. We have found that this helps identify what the gap is, what might need to be in the journey and perhaps how long it will take to reach a Shingo standard. After you have found out about your current state the next step is to identify your future state and the roadmap to get there. 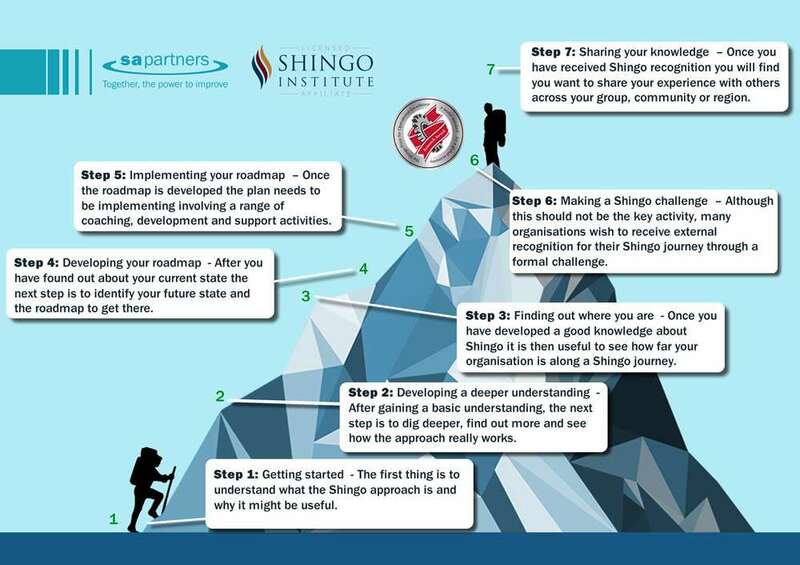 We have found that many organisations find it hard to move forward and often need some help in developing an effective and realistic roadmap for their Shingo journey. Once the roadmap is developed the plan needs to be implementing involving a range of coaching, development and support activities. We have found that implementation can be a lonely journey and often needs outside mentoring support. Although this should not be the key activity, many organisations wish to receive external recognition for their Shingo journey through a formal challenge. We find that there is a certain skill in putting forward a challenge. Our experience with almost 20 challenges means that that we can help you in the challenge process. Once you have received Shingo recognition you will find you want to share your experience with other across you group, community or region. We have worked with many organisations in sharing their journey, including in Shingo Research Award publications.